Yea....not an April Fools Joke. Amazing. The Hub Network, the fastest growing children's cable network, has optioned the rights to a new series, "KISS Hello Kitty" (working title), based on the highly successful KISS x Hello Kitty line of products from Sanrio, maker of Hello Kitty, a pop icon since 1974. 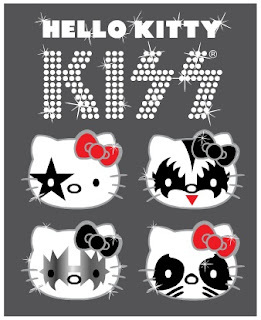 KISS, an iconic rock band known for its creative merchandising, and Hello Kitty, one of the most unique and popular lifestyle brands, came together in 2010 for an unexpected collaboration — KISS x Hello Kitty. This global collection of hugely desirable co-branded products connects KISS and Hello Kitty followers all over the world with hundreds of licensed items across all categories, including apparel, toys, electronics, stationery, and back to school merchandise, among others. The Hub's new series, "KISS Hello Kitty" (working title), will feature the four KISS x Hello Kitty characters living their rock 'n' roll dreams and bringing pink anarchy to every situation they are in. The all-new animated series is in the initial stages of development with Mr. Simmons slated to be one of the executive producers. The series will be produced by KISS Catalogue Ltd. and Sanrio. "We are thrilled to have these two seminal brands, KISS and Hello Kitty, on The Hub," said Margaret Loesch , President & CEO of The Hub. "Fans of The Hub know we are a distinct brand dedicated to providing clever, imaginative, and cool shows that families can watch together. The tone and style of the 'KISS Hello Kitty' TV show is a perfect fit for our network." "The Hub Network is the perfect home for the TV show, 'KISS Hello Kitty,'" said Mr. Simmons. "We are incredibly excited about this opportunity and want to make all our millions of fans worldwide proud of a show they can watch with the whole family." "Knowing and viewing The Hub as I do daily with my three children, it is the perfect home for us to bring the 'KISS Hello Kitty' juggernaut to yet another generation," said Mr. Stanley. "I'm excited to develop this project with The Hub as it ensures it will have family appeal while keeping its brash and nurturing individuation." "This is not the first Hello Kitty crossover for Sanrio, but for sure the most unexpected," said Roberto Lanzi , Operating Officer, Sanrio Co., Ltd. "The idea sounded crazy in the beginning, but Gene and Paul are not only rock icons, they are incredible creative minds who were soon able to see a future success. Actually they are huge fans of Hello Kitty and now great friends of Sanrio." We eagerly await word on My Little Pony Batman for 2014.